Is India's failure to bag foreign reactors the real reason behind its announcement to set up 10 nuclear plants on its own? For 12 years, three governments and two prime ministers invested high political and diplomatic stakes to enable foreign investment in India’s nuclear power sector. So when the Union government on May 17 decided to go indigenous and approved 10 nuclear plants to be built by the Nuclear Power Corporation of India Ltd (NPCIL), there were as many surprises as questions. As per the national energy policy, India plans to have 14.5 gigawatt (GW) nuclear capacity installed by 2024. The share of nuclear power in the total energy mix should reach 25 per cent by 2050, as per the policy. At present, the country has installed nuclear power capacity of just 6.78 GW. The 10 proposed plants will add another 7 GW. So what prompted the government to build new nuclear plants? The uncertainty in the global nuclear market, say experts. “A number of companies that were supposed to enter India’s nuclear sector are under financial duress. This certainly is a reason behind India’s decision to move on with its indigenous technology,” says Anirudh Mohan of New Delhi-based think tank Observer Research Foundation. India has been in talks with three foreign players—Westinghouse Electric Company, owned by Toshiba, Areva, and GE-Hitachi. 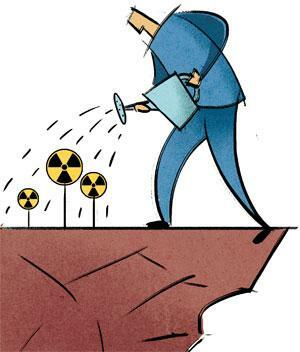 India even diluted the Civil Liability for Nuclear Damage Act, 2010, to accommodate the interest of MNCs. In 2015, the Modi government passed an executive order that transferred the accident liability risks to taxpayers. The order also prohibits victims of any potential accident to sue the companies. Even these incentives could not kick-start the foreign-sourced nuclear plants. During Modi’s visit to France in 2015, the NPCIL and Larsen & Toubro signed an agreement with Areva for a 1,650 MW nuclear plant in Jaitapur, Maharashtra. Days later, Areva filed for bankruptcy. In 2006, Toshiba acquired US firm Westinghouse to enter India’s nuclear energy sector. The takeover, however, proved fatal for Toshiba, which registered a net loss of $9 billion in the 2016-17 financial year. As a result, Westinghouse filed for bankruptcy on March 29. The company is in talks with India for setting up of two plants in Mithi Virdi in Gujarat. GE-Hitachi on June 8 said it will curtail the financial risks in the two nuclear plants in the UK, whose construction will start in 2019. The company plans to set up two plants in Kovvada in Andhra Pradesh. A former chairperson of the Indian Atomic Energy Regulatory Board says it was a “foolish” decision to enter into a deal with MNCs for reactors. He says: “There were problems with the deal from the beginning. Basically, MNCs zeroed in on India for a market. So the US government intervened and promised India to help enter Nuclear Suppliers Group (NSG) if it purchased 10,000 MW reactors from the companies. India agreed to buy 10 reactors that were never built. No wonder nothing materialised.” He believes policymakers are now just trying to save their face by going indigenous. Experts also believe India is gradually realising that importing nuclear reactors is not financially feasible for the country, especially when other energy sources are getting cheaper by the day. Energy expert Soumya Dutta says a nuclear plant using imported reactors is roughly four times more expensive than all other energy sources. As per his analysis, installation cost of the proposed Areva plant in the UK is around Rs 52 crore per MW. The cost in India will be around Rs 45 crore because the country has cheaper labour than the UK. In contrast, the installation cost of the indigenous reactors is Rs 11-12 crore per MW. The installation cost of a solar power plant is Rs 8-10 crore. Coal power plants are the cheapest with an installation cost of just Rs 5-6 crore per MW. Logically, the cost of electricity generation is the highest in nuclear plants. During the negotiations for the Jaitapur plant, Areva had initially said it will sell electricity to the discoms for about Rs 9.30 per unit. It was finally fixed at Rs 6.50 per unit. The generation cost of coal power plants using modern technology is around Rs 3.20 per unit. For solar plants, it is Rs 2.60-6. Dutta adds that solar plants make more sense because they, unlike nuclear plants, do not have hazardous leftovers. While the Indo-US deal did not help in bringing in the technology, it definitely has provided India access to raw material. India can now import uranium from Russia, Australia, Canada and Kazakhstan. Before the deal, Indian power plants were running at 55 to 60 per cent of their capacity because the country did not have sufficient uranium reserves. With all possibilities, the new 10 plants will use imported fuels. Jaideep A Prabhu, a specialist in nuclear and diplomatic history, feels that the decision to build nuclear power plants is part of India’s strategy to enter the NSG. “I think that the sudden interest in domestic technology is designed to put some pressure on the international community in terms of NSG membership—foreign reactors will all be under safeguards but domestic ones have no such obligation. If the world wants India’s reactors under the International Atomic Energy Agency’s watch, they will have to stop being so dismissive of Indian concerns,” he says.